This tomato soup with goat cheese is a simple and easy way to make soup that uses just a few ingredients and is full of bright, tangy flavor. We are having an extremely wet winter in Los Angeles. After four years of drought, the rain is much needed, but the amount of rain has been worrisome as well. Today we are being pounded by a steady, driving rain that is predicted to last for 24 hours. This storm is the biggest storm LA has seen in a decade. Mudslides and flooding are on everyone’s mind. To take my mind off the storm, I have been getting my inner Marie Kondo on and spending the day organizing things around the house. I’m also making soup – a tomato soup with goat cheese. It’s been a favorite of mine for a while since it’s so easy to make, uses just a few simple ingredients and is full of bright, tangy flavor – perfect for a wet wintery day. The first few times I made this recipe I used a hand blender to puree the soup. Then I realized that I could cook the onions, garlic and herbs first and add them to the uncooked tomatoes and stock in the blender. Give it a whirl to puree all the ingredients before pouring it back into the soup pot to simmer for 15 minutes. This was a much easier way to puree the soup – fewer splatters and no hot messy accidents. What kind of soup do you like in the winter? I’m always looking for recipe inspiration so I’d love to know which soups are your favorites – let me know in the comments below! As noted above, you will puree the uncooked tomatoes and vegetable stock with the sautéd onions, garlic and herbs before simmering the soup. No need to ladle hot soup into a blender. Let the goat cheese melt for a few minutes in the soup before stirring. If you’re not a big fan of goat cheese, you can add some cream or parmesan cheese instead. Recipe adapted from this New York Times recipe. 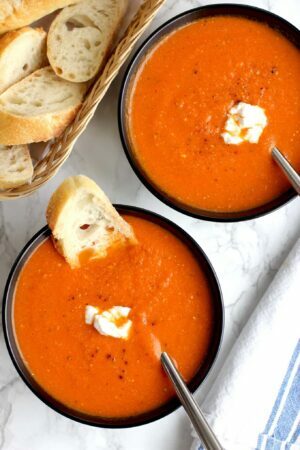 Tomato soup with goat cheese is an easy to make soup that uses just a few ingredients and is full of bright, tangy flavor. In a soup pot over medium low heat, add olive oil, diced onion, minced garlic, red pepper flakes, dried thyme and black pepper. Sauté for 7 minutes, stirring occasionally so it doesn’t burn, until onion mixture is soft and slightly browned. 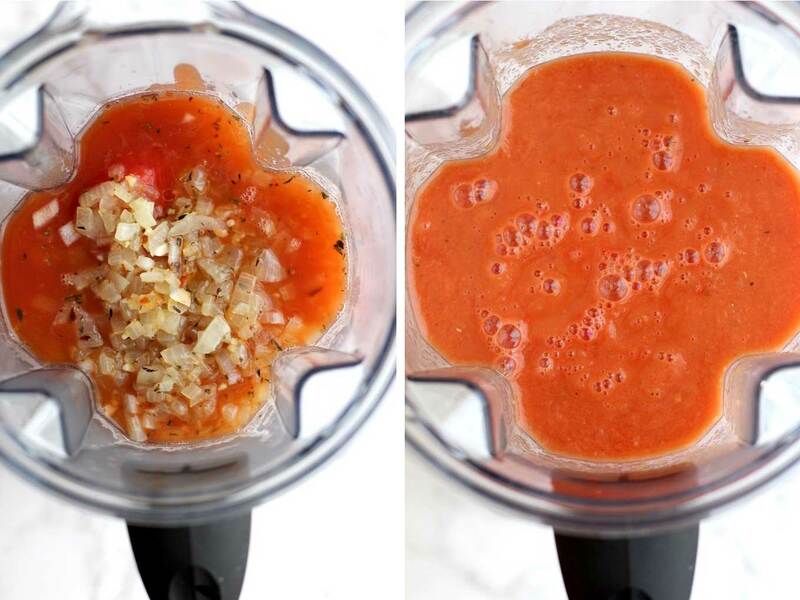 Add all the tomatoes and their juices from the can and the vegetable stock to a blender. Add the sautéed onion mixture to the blender. Blend soup until fully pureed. Pour soup back into soup pan and bring to a boil. Turn heat to low and simmer soup for 15 minutes. Stir in goat cheese and let melt for a minute or two before stirring. Stir to combine. Top with a sprinkle of goat cheese and black pepper and serve. Delicious! How long will it last in the fridge? Hi Taylor – this should last 2 to 3 days in the fridge in a bowl tightly covered with plastic wrap. Hope you try it. I was looking for a tasty soup recipe and I found it. Thanks a lot,Geraldine! I have never been in a bad storm before. Every time there is any kind of storm, I am always away. This must be very comforting on a rainy day. Or any kind of day really. I love the addition of goat cheese!! I finally got a Vitamix, Sue, and I love it! Hope you enjoy the recipe if you try it! Well the rain certainly hasn’t let up much since you shared the recipe. A comforting bowl of your tomato soup might need to be daily therapy. Soup as daily therapy is right, Karen – the rain has been relentless here! Thanks so much, Cathleen – a grilled cheese would be perfect! Thanks, Greg – the goat cheese definitely cuts through the sweetness of the tomatoes and give it a zingy kick! 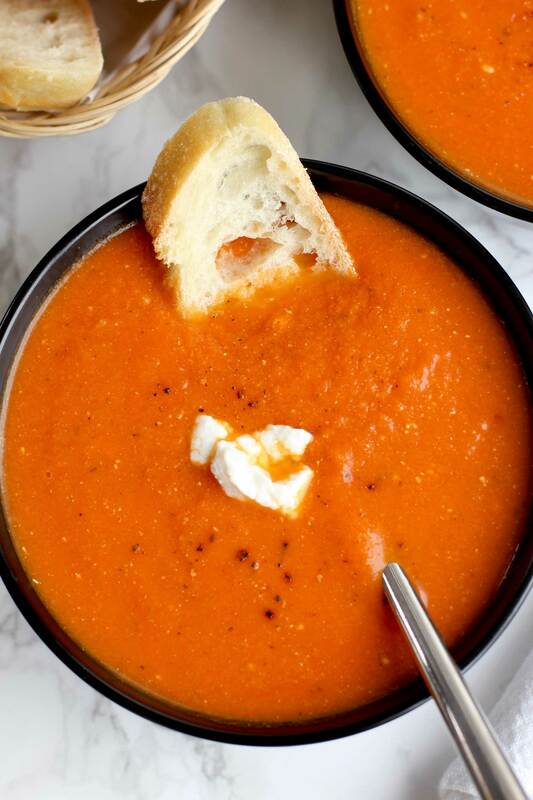 Goat cheese and tomato soup is a always a sure fire winner! I am glad you are getting much needed rain! I love a great tomato soup and I love how quickly this one comes together. A little dab of goat cheese would be the perfect compliment to this soup! We’ve had so much rain this year, Kathy – next week we’re supposed to have 4 or 5 days of rain in a row! Good for the plants – everything is so green and lush here – just gorgeous. 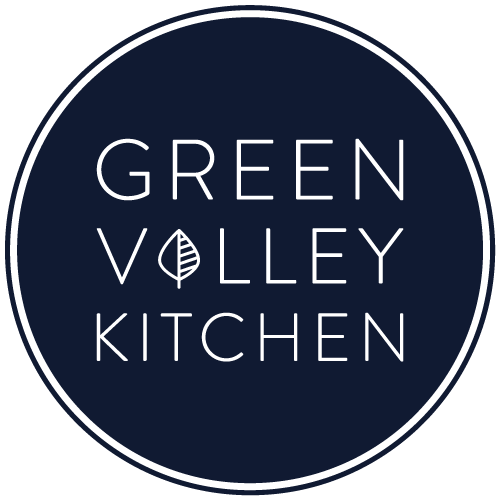 Tomato soup and grill cheese is a favorite combo of mine all year long Geraldine! This recipe sounds delicious. I hope the rain doesn’t do too much damage. I’ll keep my fingers crossed and say a few prayers! Thanks, Mary Ann – so far, so good with the rain. There have been some mud slides in the LA area but nothing too bad – but next week we’re in for 4 or 5 days of rain in a row – so fingers crossed it’s not too bad. Nothing like creamy soup to make rainy days better! I love the addition of cooked onions! You’ve inspired me to tackle my ‘junk drawer’! This could take a while! 🙂 Have a great weekend, my friend! Get to that junk drawer, Annie – it’s so satisfying to get rid of stuff! Looks fantastic! I’m such a big fan of soups, especially tomato so this looks lovely! No doubt, rain is much needed, but too much all at once isn’t good. Those slides are a mess and can be so dangerous. Organizing and making soup on a rainy day is a good way to spend the day indoors. I love to be organized too. It makes me feel peaceful. Clutter makes me feel stress – my husband doesn’t understand this. I crave tomato soup, especially when paired with crusty sourdough or a grilled cheese. I love how you’ve paired this with goat cheese and made it fast and easy to whip up. And who can resist that bright color! Gorgeous work, Geraldine! I love creamy soups like this in the winter…tomato and squash soups are my favorite. I am with you on the house organizing. Isn’t it the greatest feeling? I mean I’ve never done, but at least I get a good start some days! Loving that goat cheese on top! Extra yummy! I agree, Karen – It feels great to look into a closet or cupboard and see everything all neatly organized. I’m tackling the garage next! Thanks, Cheyanne – I’m with you on rainy days and organizing the house – it’s the perfect excuse to just hang out at home but get something done at the same time! Thanks, Sues! I’m a big fan of butternut squash soup too!